Simplicity Nuts, Bolts & Screws: Jacks is your Place! 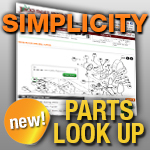 We have the Nuts, Bolts & Screws you need, with fast shipping and great prices! For lawn mower parts and accessories, think Jacks! SIMPLICITY : 1691167 Sunstar, 1691168 Sunstar, 1693109 Legacy, 1693110 Legacy, 1693975 Prestige, 1694171 Prestige, 1334 Pacer Series, 1694494 Pacer Series, 1692007 Landlord 18Hp, 1692301 Landlord, 1691465 Vanguard, 1691466 Vanguard, 1692900 Zt, 1692901 Zt, 7800379 Axion, 1690334 7010, 1690338 7014S, 1690353 7012H, 1690218 710 Tractor, 1690410 714S Tractor, 1690419 716-6 Tractor, and many more. SIMPLICITY : 1691167 Sunstar, 1691168 Sunstar, 1693109 Legacy, 1693110 Legacy, 1693975 Prestige, 1692006 Landlord 18Hp, 1691465 Vanguard, 1691466 Vanguard, 1690203 7016, 1690204 7010, 1690216 712S Tractor, 1690218 710 Tractor, 1692404 Regent, 1692406 Regent, 1691954 Gth 20Hp, 1691958 Gth-L 17Hp, 1692606 512H, 1692637 512G, 1692077 Broadmoorlth, 1692079 Broadmoorlth, And Many More. SIMPLICITY : 1694171 Prestige, 1692901 Zt, 1693231 Zt, 1692720 Broadmoor, 1692721 Broadmoor, 1692836 2516H, 1693105 2516H, 1692787 Landlord, 1692793 Landlord, 1693356 Broadmoor, 1693357 Broadmoor, 1693328 Regent, 1693330 Regent, And Many More. SIMPLICITY : 2690447 Pacer Series, 5900630 Pacer Series, 1692900 Zt, 1693295 Zt, 1692751 Coronet, 1692753 Coronet, 1692690 Broadmoor, 1692691 Broadmoor, 1693059 1614H, 1693061 1615H, 1692755 Coronet, 1693031 Coronet, 1693033 Coronet, 1693215 Regent, 1693217 Regent, 1693366 1614H, 1693368 1615H, 1693608 Broadmoor, 1693547 2515H, And Many More. SIMPLICITY : 1693975 Prestige, 1692006 Landlord 18Hp, 1692054 512G, 1692056 512H, 1691233 Vanguard, 1690350 811Gt Tractor, 1690603 818Gt Tractor, 1692527 Broadmoor, 1692531 Broadmoor, 1692437 Landlord, 1692482 Front Cut, 1692483 Front Cut, 1692169 Coronet, 1692170 Coronet,, 1692637 512G, 1692077 Broadmoorlth, And Many More. SIMPLICITY : 1690907 1321Pp, 1691001 1321Ppe, 1691017 Sunstar, 1691018 Sunstar, 1693115 Legacy, 1693116 Legacy, 1693973 Prestige, 1693974 Prestige, 1692301 Landlord, 1692302 Landlord, 1692054 512G, 1692055 512G, 1692406 Regent, 1692407 Regent, 1691953 Gth 20Hp, 1691954 Gth 20Hp, And Many More.